FORCE Addresses the Business Meeting of the American Academy of Osteopathy in Dallas. In March, 2018, hundreds of practicing osteopathic physicians gathered in Dallas to attend the Academy’s Convocation. 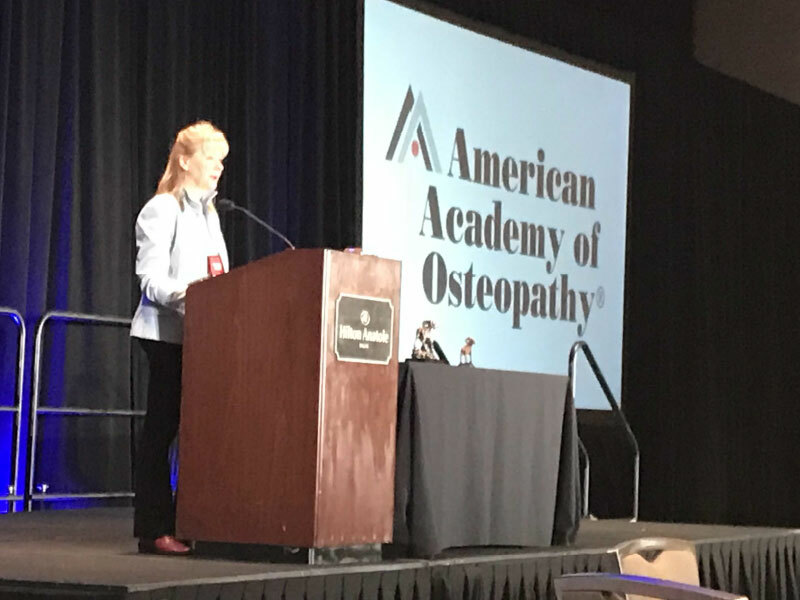 FORCE President, Virginia M. Johnson, DO, FAAO, addressed the group assembled for the Annual Business Meeting, speaking on behalf of the critical need for privately funded research in the clinical application of Osteopathic Manipulative Medicine. She highlighted how osteopathic physicians often encounter public requests for research studies, yet only a few such comprehensive studies exist. Federal funding in OMM research has been limited, and is expected to be even less, given recent reductions in NIH spending. Dr. Johnson also presented a brief history of FORCE, including its revitalization as donor membership foundation, encouraging the DO’s with a strong interest in the future of osteopathic manipulative medicine to participate.